Sam Weston, the owner of Weston Technologies is furious over the security breach in his Research Lab. 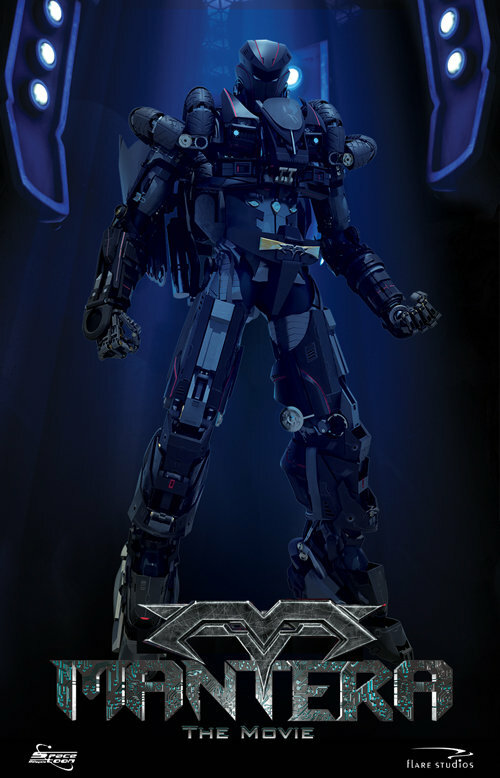 The prototype of his latest weapon system "Mantera" or MAN - Transformable Exo-Robotic Armour was sabotaged and destroyed. Invaluable research data was stolen and deleted from the company's mainframe. His main scientist who is leading the research team, Dr. Natasya was missing. The buyer for the new technology is pressuring Sam to deliver the prototype or the deal is off. To make matter worse, the wreckage and debris from the destroyed "Mantera" was accidentally shipped to the other side of the world.... to a young man by the name of Azman, in Malaysia. Who is Azman, and what makes him the chosen one? Everything will be revealed in 'MANTERA'. About a boy, Azman who stumbles upon a nano-tech glove which can transform his motorbike into body armor. The technology was designed by Dr.Natasya Irina Pushkin, a scientist at the Western Tech. Corporation. However, when she realizes that her creation will be used by a man with the power to destroy the world, she is determined to sabotage it. I haven't encountered so much bad written cheesy dialog per minute in awhile. You can't be writing that awful unless you consciously try to replace every possible line with a cliché phrase. I can understand medium budget CGI, I can forgive simpleton plot (yet another battle of good vs evil), but what on earth made them name prime forces "Alliance of Light" and "Legions of Darkness"??!! Those are literally the names of the two, and its not even ironic. And so on it goes all through the movie. The script is created straight out of some kid's imagination, we have savior who is a "purest soul", evil corporation, spacecraft stolen from X-Men, Star Gate-ish teleport device... heck! they even managed to clue in a martial arts training montage. The only plus side is that global crisis does really feel global - we are shown different countries, nations, languages - and are not happening somewhere in the backyard of a typical USA small town. First off, all the other reviews are absolutely correct. All of them. Even if they contradict one another. Also, I would rate it a 10 if it were a comedy. I thought about rating it a 5, the average...but that didn't seem fair to the readers of these reviews. Second, I am only about halfway through the movie...but I have been laughing so much I had to take a break and do a little internet research on it. This movie makes the stuff on the SciFi network (Sharknado and the like) seem like grade A work. To put things into some perspective, the movie is a Malaysian effort. Yes, it's dubbed...but from what language(s), I'm not sure--Malaysian? Russian? But for it's obviously limited budget, the Mantera animations aren't too bad...for a cartoon, except it's a live-action movie. Actually, the animations may be better than the standard SciFi network fare. As has been well covered by other reviews, I concur that large portions of the movie are blatant copies of other older works. Perhaps the most egregious offense is the scene where Mr. Miyagi's Crane Technique is practiced (about 45 min into movie). There are so many references, and funny enough, a lot are from the 80's. Think Streethawk meets Robotech/Megazone23 meets Karate Kid meets G.I. Joe. I even heard "Archangel" used a character's name...like in Airwolf! And when you are done, follow it up with "Kung Fury" available for free on YouTube and now also on Netflix!